The Samsung Galaxy Mega is a phablet available in two sizes. The larger 6.3-inch version comes with NFC. Both new phones come with 8MP rear-facing and 1.9MP front-facing cameras, a dual core processor and run Android 4.2 Jelly Bean. Published specifications boast of NFC in the 6.3-inch model, but no mention is made of its inclusion in the 5.8-inch variant. 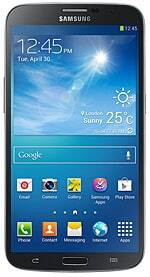 The Galaxy Mega was announced on 11 April 2013 and will be available globally, beginning in Europe and Russia in May.